The Usos kicked off WWE Fastlane against Shane McMahon and The Miz. Rikishi’s twins defended their SmackDown Tag Team Championships against Mr McMahon’s son and Cleveland’s hometown son. Needless to say, the Cleveland Ohio crowd was firmly behind McMiz. The A-Lister had never won a WWE title in front of a hometown Cleveland crowd and he really wanted to break that trend. With Mr. Miz — The Miz’s father — at ringside, he fought alongside Shane McMahon against much more experienced tag team wrestlers in The Usos. The Miz came very close to winning it for his team a couple of times, but he couldn’t close the deal. Then Shane McMahon went up for a Coast To Coast and Jimmy Uso jumped on the top rope on the other side and tried to splash The Miz, but Shane dropkicked him out of the air… sort of. The Miz climbed to the top and went for a frog splash, but he was countered and rolled up for the pinfall. 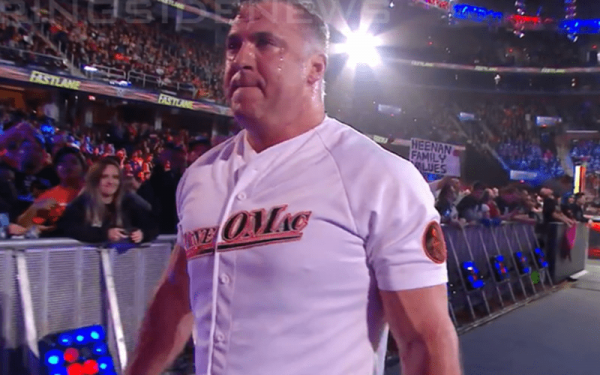 After the match was over, The Miz and Shane McMahon hugged and had a moment with The Miz’s father. Then, after Shane raised The Miz’s father’s hand and gave him a high-five — Shane McMahon dropped The Miz with a blindsided clothesline. 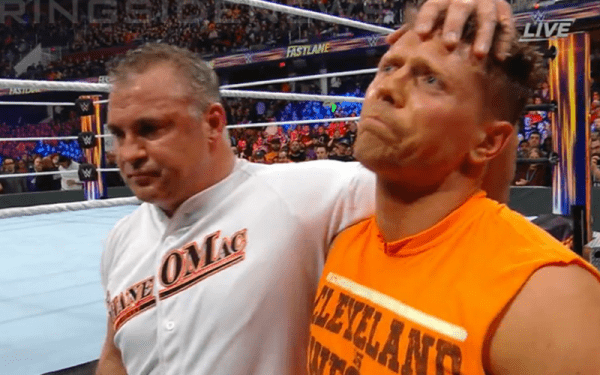 Shane McMahon demolished The Miz with some kicks in front of his hometown crowd and tore off The Miz’s Cleveland-inspired official WWE t-shirt. All of this occurred as The Miz’s father watched in shock. This was a pretty violent assault and continued after Shane McMahon grabbed The Miz’s father’s face and pushed him back. Then Shane McMahon locked on a choke-hold and The Miz passed out. This was certainly a heel turn from Shane McMahon and he got a ton of heat. It looks like Shane McMahon vs The Miz is going to be the direction for WrestleMania.